The Anne T. Kent California Room is a special collection on local history which has been serving the Marin County Free Library system since the mid-1930s. Their mission is to collect, preserve and share local, regional and state history. 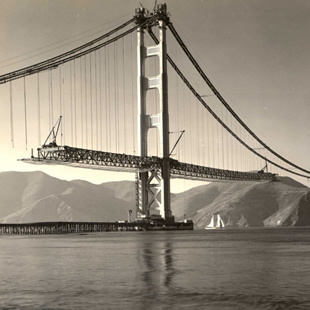 Their many primary source materials focus primarily on the history of Marin County and include photographs, maps, oral history interviews, historic motion picture footage as well as original documents and ephemera. Significant special collections include: the history of San Quentin State Prison; Frank Lloyd Wright & the Marin County Civic Center; the California Motion Picture Corporation; the Kent Family and the history of Kentfield; Marin’s Mountain Play; and an extensive Unrecorded Marin County Map & Survey archive, 1849-1988. They engage the community by hosting free public events, a local history lecture series and ongoing exhibits. They have worked with the County of Marin to present the history of Marin and the Marin County Civic Center through permanent and changing displays. Their collection includes over 30,000 historic maps and surveys; over 25,000 photographs; 575 oral history interviews; 345 linear feet of newspaper and pamphlet files; 35 linear feet of original documents; 54 linear feet of biography files; 36 linear feet of historic directories and phonebooks; over 500 local yearbooks; 200 local periodicals and more than 11,000 books. They provide free public access to their collection Monday-Friday. Please call them for an appointment at: 415-473-7419. The California Room’s website and digital archive can be accessed at: marinlibrary.org/californiaroom.